To celebrate Weekly Shonen Jump’s fiftieth anniversary, Bandai Namco is bringing together characters from some of Japan’s most popular manga series to fight with and against each other. Shonen Jump fans will know this isn’t the first time these characters have been brought together, in fact, the very first time this occurred was the twentieth anniversary of Weekly Shonen Jump (Famicom Jump: Hero Retsudenon the NES). 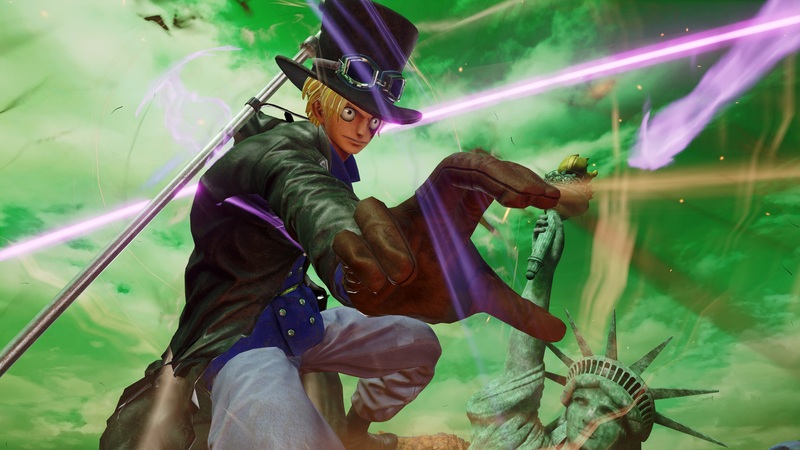 Unlike J-Stars Victory VS which launched on both the PlayStation 3 and PlayStation 4 back in 2014, Jump Force is being built from the ground up to utilise the full power of current generation consoles. The premise of Jump Force is currently a mystery, with only a few hints being dropped by Bandai Namco since the game’s reveal at E3 this year. What we do know is that the Shonen Jump characters are fighting in our world to battle against a threat. Supposedly this threat has the power to wipe out the entire humankind, so it’s fortunate we’ve got the Jump Force on our side. Judging by the trailer, it appears Ryuk and Light Yagami from the Death Note series will play an important role in the story. Sadly, these two characters will not be playable in the game, however, right now we do know which six series are confirmed for the game: Bleach, Dragon Ball, Hunter x Hunter, Naruto, One Piece and Yu-Gi-Oh! Yes, you read that correctly, Yu-Gi-Oh. If the other Shonen Jump crossover games are anything to go by, we can expect to see several more series enter the fray before the game launches in 2019. In addition to using a completely different engine, Jump Force plays like no other Shonen Jump crossover game. 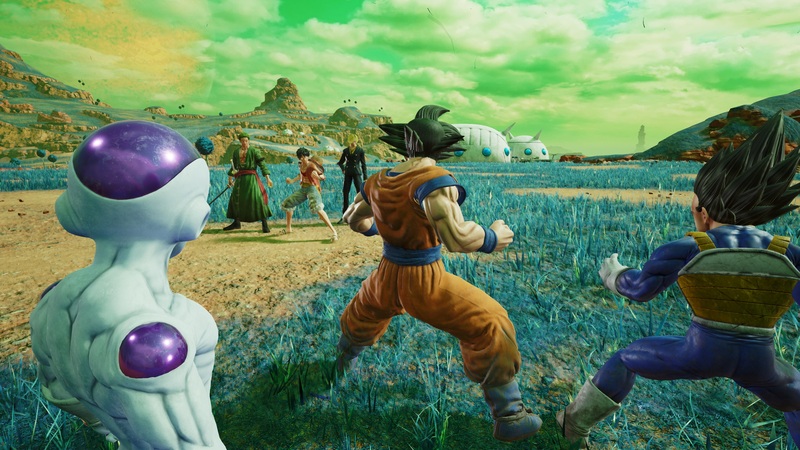 Unlike most games where you pick a team of three characters, in Jump Force your entire team shares both the health and special meters. This helps to simplify the fighting as you never have to worry about having to tag out, other than having a potential bad match-up against your opponent’s team. As long as you have a powerful point character, in theory, you could pick two side characters purely for their assists. Playing Jump Force for the first time, I couldn’t help but be disappointed by the gameplay. I don’t know what I was expecting, to be honest. The initial trailer at E3 made Jump Force look interesting, but actually playing it revealed how hollow it is as a fighting game. No matter which character I picked, it felt as if the game was made purely to push buttons and watch cool things happen on the screen. Don’t get me wrong, it was cool to see Sasuke Uchiha slam a Chidori right in Frieza’s face, it’s just the game is so simple that it feels boring to fight the CPU. Perhaps playing against a real person would improve the game considerably. As of right now, I cannot say I’m impressed by it. While the game may look nice in motion, it’s more of a spectacle than a game you take seriously. A lot of people may not find this to be a problem as not every game needs to be competitive, however, I was hoping Jump Force would be closer to games like Soul Calibur and Tekken rather than the Dragon Ball Xenoverse series. Jump Force does feature mechanics like tag juggling to extend combos, though I can’t see this game being played competitively in its current state. The developers have chosen an art style that doesn’t appear to suit any of the characters. As you can see from the screenshots, the semi-realistic aesthetic makes the characters look out of place, especially when compared to the stages. Of course, this is a purely subjective take on the art-style, but for me, I don’t think Jump Force looks great. In motion, you’ve got plenty of blur and flashy effects to mask the visuals, but in screenshots, you can really see how bland the art style is. As for the performance, despite the game being released sometime in 2019, Jump Force runs surprisingly well. 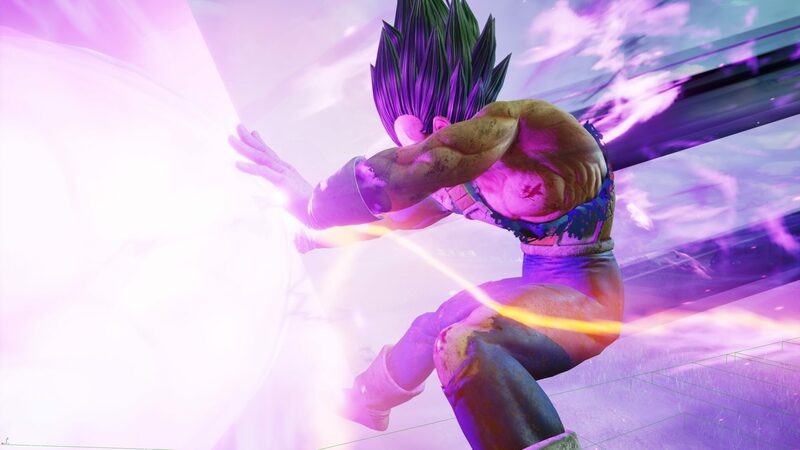 Jump Force targets 30FPS but appears to drop frames whenever something dramatic happens on the screen (usually involving a massive special move like Goku’s Spirit Bomb). The effects of the game crazy over the top, featuring silly amounts of motion blur and all the particle effects you could ever ask for. I played Jump Force on a PlayStation 4 Pro, however, I have no idea what enhancements have been made to the game (if any). If I had to guess, I would assume it was purely based on increasing the number of effects on the screen. It would be great if the enhancements to Jump Force could increase the frame rate, though this may be something we only see on the PC version of the game. Dragon Ball Xenoverse and Naruto Ultimate Ninja Storm series will be pleased to find that they are receiving more of the same gameplay they know and love. While the gameplay may be lacklustre right now, there is still plenty of time for that to change (though it is extremely unlikely). The developers have been coy about the story mode since the game was revealed, so here’s hoping that will be Jump Force’s saving grace. Jump Force is scheduled to release sometime in 2019 for PlayStation 4, Xbox One and PC.